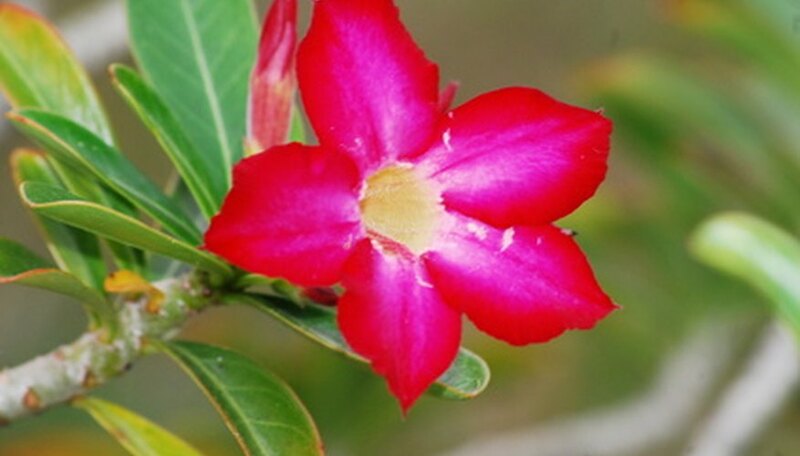 Desert rose (Adenium obesum) is a tropical succulent native to the Philippines, Thailand and India. Desert rose features bright, trumpet-shaped blossoms in pink and red hues. These plants thrive on humidity and prefer more watering that desert succulents. Gardeners can keep desert rose indoors anywhere, but can only grow the plant outdoors in subtropical or tropical areas. Move indoor desert rose outside only when temperatures are higher than 40 degrees F day and night. Place your desert rose plant in a location where it will receive sun for six to eight hours a day. In cold climates, grow your desert rose plant in a container, as they can't tolerate temperatures below 40 degrees F. In subtropical and tropical areas, grow your desert rose outdoors. Fertilize desert rose plants with a liquid fertilizer designed for succulent plants. Apply the liquid fertilizer weekly, following the dosage range on your fertilizer package. For container-grown desert rose, the University of Florida suggests applying a half-strength dose of 20-20-20 liquid fertilizer weekly. Water desert rose regularly during hot weather, when temperatures are above 80 degrees F. Do not allow the soil to dry out between watering. In cooler periods, water the desert rose until the soil is saturated, then allow the soil to dry out entirely before watering once more. To check the soil's moisture content, stick your finger 1 to 2 inches into the soil and water only when it feels dry. Check your desert rose for signs of frost damage if the plant is left outdoors during cold weather. Frost-damaged branches may shrivel or change color and blossoms on these branches can die. Clip away any frost-damaged branches using anvil pruners. If the branches aren't removed, they may contract rot and spread it to other areas of the plant.